On the 22 march 2017, at our faculty Joint Meeting of DEI and Magnetics IEEE Polish Section Chapters was held. Among participants were colleagues form our department, representatives from Technical Universities from Częstochowa, Lublin, Gliwice and Łódź and also representatives form industry. Aim of the meeting was to initiate collaboration between local DEI and Magnetics chapters in field of Dielectrics insulation and Magnetics materials. We kindly inform that, in September 2016 Polish Society of Electromagnetism Copmetition for the best Master and PhD thesis in field of Electromagnetism was held. supervisor: dr hab. inż. 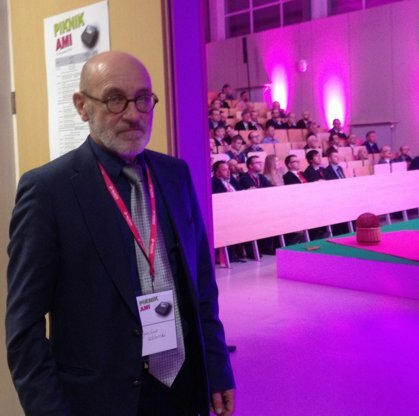 Eugeniusz Kurgan, prof. n.
Warmly congratulation to Piotr's achievment and we wish you next success !! 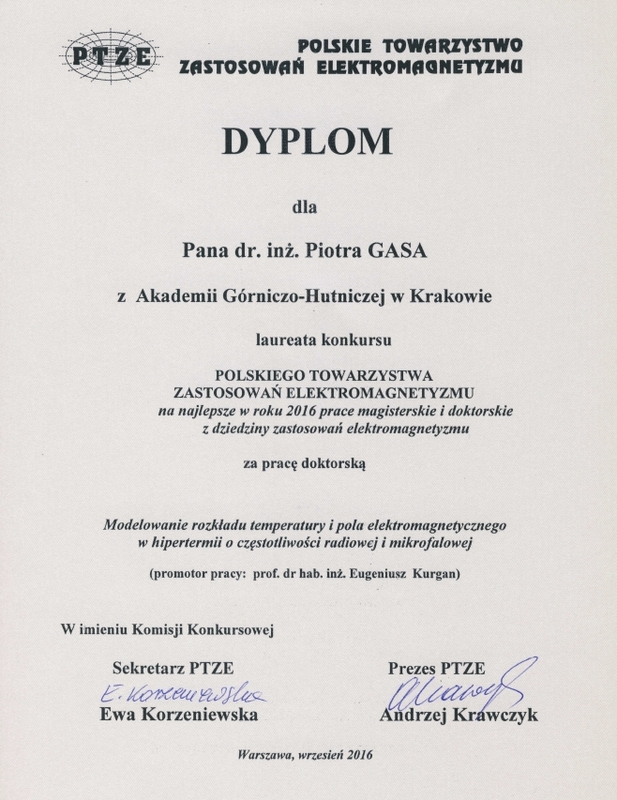 We kindly inform that, on 9.12.2016 The XXVI Competition of prof. Jerzy I. Skowroński award for the best thesis in electrical engineering, high voltage and electrical engineering was held. Warmly congratulations to The winner and the other winners and we wish you next success !! On 26-28.01 guest of our Electrical Engineering Department was prof. Emel Onal from Istanbul Technical University (ITU). Professor is specialist in field of High Voltage Engineering and Signal Analysis. Prof. Emel Onal was visiting researcher inter alia at IEH Stuttgart University about GIS technology and transformers. 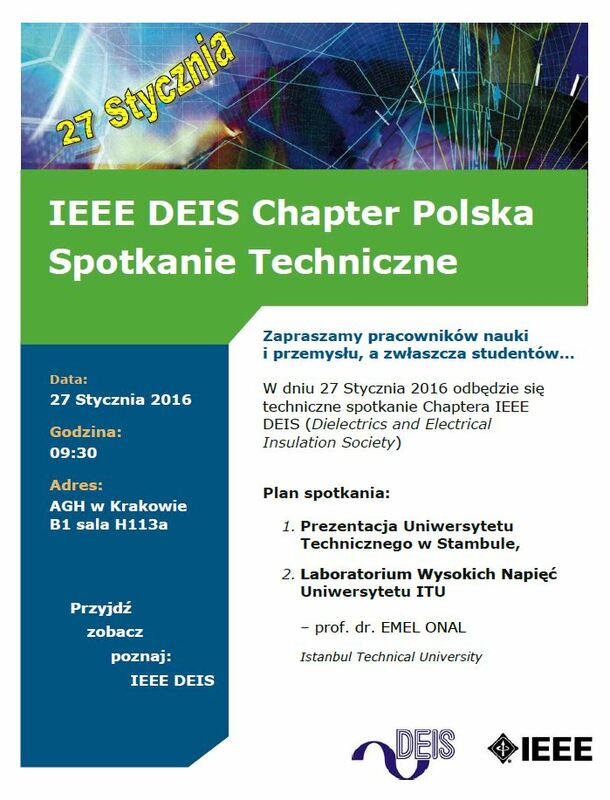 During visit at AGH, the Professor gave a lecture about High Voltage Technology and about Istanbul Technical University, lecture was part of Technical Meeting of DEIS Chapter in IEEE Polish Section. Result of prof. Emel Onal visit at our faculty will be cooperation between our Faculty and Electrical Engineering department at ITU. , which operates in the Polish Section of the IEEE. 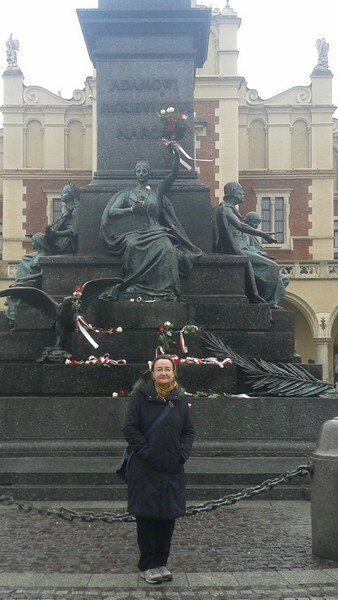 The meeting will be held on 27 January 2016 r.
of AGH University of Science and Technology in Krakow. Below invitation containing the agenda of the meeting. 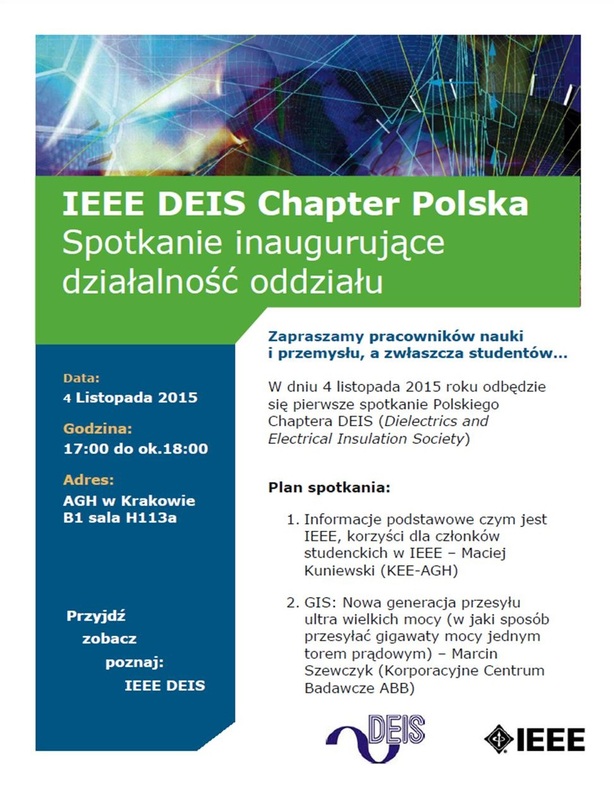 Since this will also be a meeting to promote the IEEE, DEIS Society, as well as our Chapter, we invite students and other persons interested in the subject. Main prelegent is Prof. Emel Onal from Istanbul Technical University. we invite you to follow and like her ! From 15 to 24 November 2015. 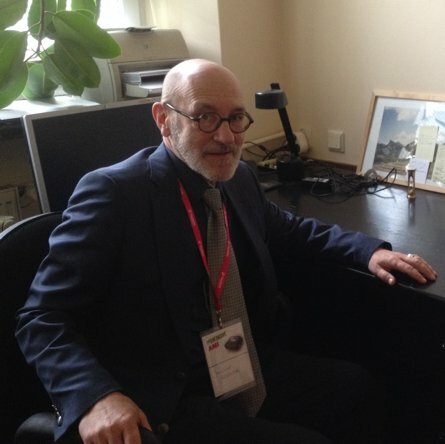 Guest of the EAIiIB Faculty and of our Department was Prof. Jarosław Szklarski from Mining University in St. Petersburg . Professor It is a specialist in the field of flow and reactive power compensation and in the area of issues related with the quality of electricity. Professor is author of over 100 scientific publications. As a visiting professor he delivered lectures and seminars for students at Master and Bachelor Studies of the Electrical Engineering. 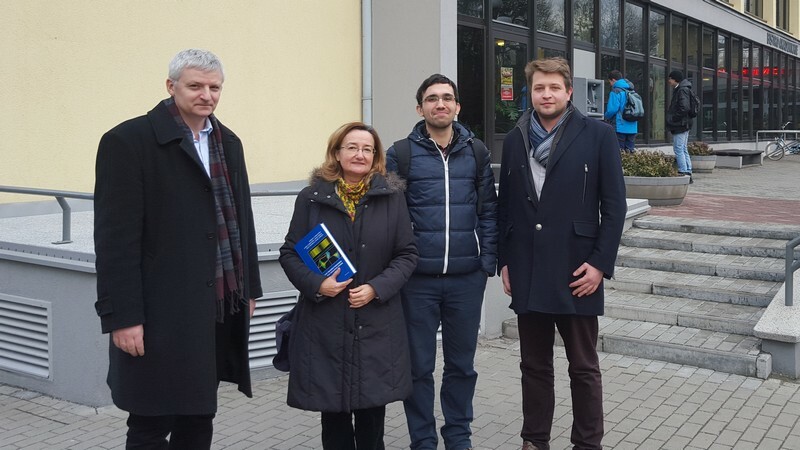 While last stay at AGH UST He also participated in Picnic AMI held at the Faculty on 19 November 2015.
which started operating in the Polish Section of the IEEE. The meeting will be held on 4 November 2015 r.
Below invitation containing the agenda of the meeting. Since this will also be a meeting to promote the IEEE, DEIS Society, as well as our Chapter, we invite students and other persons interested in the subject. On 25th September we invite everyone on next - 9th edition of Malopolska Researcher's Night ! Mandatory reservation of seats for each of the 8 shows! The maximum number of people at one show is 40. WARNING: The shows may not participate persons with epilepsy and with devices supporting vital functions, such as pacemakers, insulin pumps, etc. Today begins the next Academic Year 2014/15 . For all students and faculty employees we wish in the coming year perseverance, a huge amount of energy and distance: in learning and during the classes! We advise to attend Official Inauguration of the academic year on 04.10.2014 , more details at link . 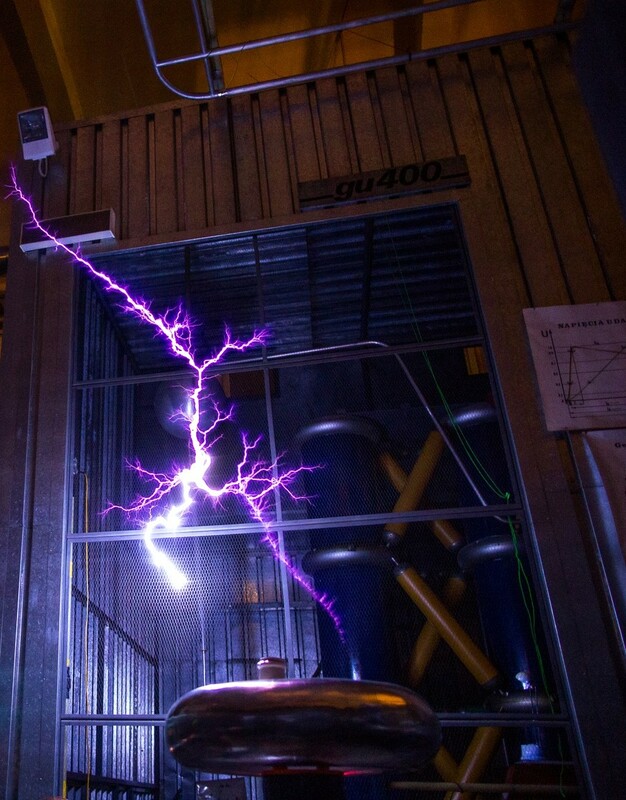 Thank you for visiting us, in this year High Voltage Laboratory hosted more than 600 people, exploring the mysteries of the high voltage. Those wishing be part in another electrifying show during the next Researcher's Night, we invite you today to participate in, the ninth edition of the Malopolska Researcher's Night, which will be in 25.09.2015 . Nearest scene Malopolska Researchers' Night is the eighth edition of events that not only permanently inscribed in the calendar of events organized in the Region, but mainly still the biggest event of its kind in the country and one of the biggest in Europe! September 26, 2014 r.